Puyo Puyo Tetris (ぷよぷよテトリス, Puyopuyo Tetorisu?) is a puzzle video game developed by Sonic Team and published by Sega for multiple platforms in 2014. The game is a crossover between the Puyo Puyo series and the Tetris franchise, and features various gameplay modes incorporating both aspects. The game includes characters modeled after the seven Tetriminos, which are different puzzle pieces each made of four blocks. 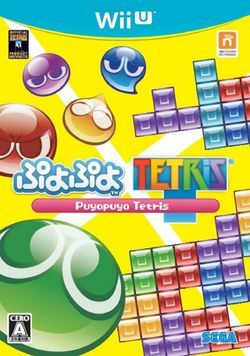 Puyo Puyo Tetris was the first Tetris-related title published by Sega since Tetris Collection, an installment in the Sega Ages series, in 2006, eight years prior. Puyo Puyo Tetris adopts the guidelines used in current Tetris titles, so the rotation patterns and colors of the Tetriminoes differ from Sega's previous releases. Puyo Puyo Tetris was released for the Nintendo 3DS, Wii U, PlayStation Vita, PlayStation 3 on February 6, 2014 in Japan. Versions for PlayStation 4 and Xbox One were announced for release on December 4, 2014. This game is a crossover of two puzzle games, Tetris and Puyo Puyo, and also a memorial title for Tetris's 30th anniversary. Some game modes are notable for mixing Puyo and Tetriminos together in one playfield. All platforms support internet battles for every game mode; the 3DS version may connect with the Wii U version, as with the Vita version and PS3 version. This game also features a replay function that records matches and saves them for later viewing. They can be shared with others via the Internet. Bonuses can be earned by T-spins, Back-to-Backs, Combos (called REN in-game), and Perfect Clears (called Bravos in other games such as Tetris: The Grand Master). This page was last edited on 20 February 2018, at 06:50.